This recipe works best with short grain rice. Make sure you rinse the rice well and then toss it into the Pressure Cooker cooking pot to cook while you are preparing the other ingredients. First, get your marinade together. Peel and mince the ginger. Slice up some raw boneless and skinless chicken thighs and add some Sweet/Black Soy Sauce, a splash of fish sauce, soy sauce and white pepper. Sweet/Black Soy Sauce is similar to molasses. It’s not salty like regular soy sauce. If you don’t have Sweet/Black Soy Sauce, add regular soy sauce and a teaspoon of sugar. Add fresh water to the Pressure Cooker cooking pot to cover the rice by about two inches and hit the Sauté button. The water will start to boil and break up the rice. Keep an eye on the pot and add more water, if needed. The rice should start to break down in a few minutes. Once the rice is soft and broken, hit the “Off” button. It’s now time to add the rest of the ingredients. Dump in the chicken broth, marinated chicken and ginger. Cook at High Pressure for 10 minutes. 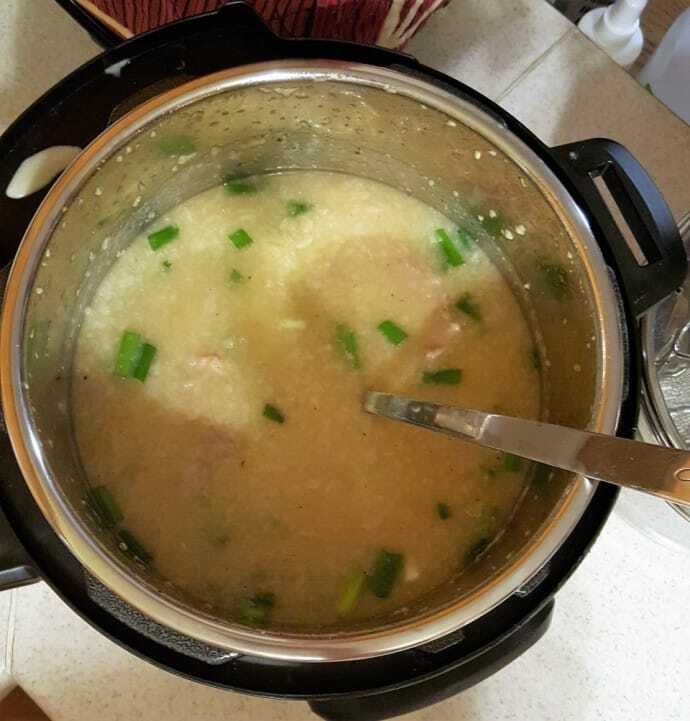 After you have removed the lid, throw in the chopped scallions, mix in and serve. I cook a lot of Asian food and love to eat it in big Ceramic Soup Bowl with Asian Soup Spoons. 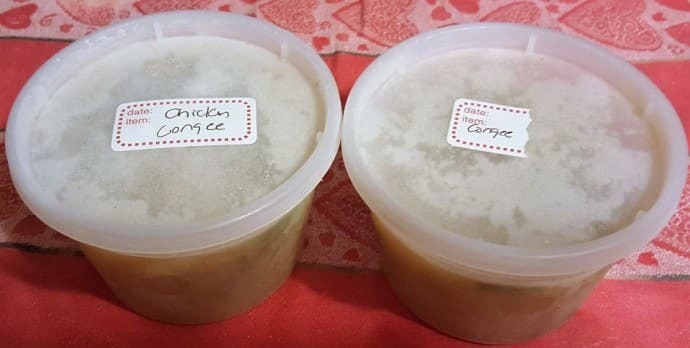 I usually make a double batch of Congee and then freeze in these Reditainers Extreme Freezer Containers, so that I can have the Congee for breakfast, lunch or dinner. The Freezer Labels are great, because they pull right off, without leaving a sticky residue. Marinate the chicken with the Black Soy, Soy Sauce Fish Sauce, ginger and white pepper and set aside. Rinse rice well and toss into Pressure Cooker cooking pot. Cover the rice with two inches of water. Push the Sauté button and with the lid off, boil for approximately eight minutes, or until rice has broken down. Add more water if needed, until the rice breaks down and is soft. Lock lid and close Pressure Vavle. Open the value and let the remaining steam escape. Open the lid and taste. Adjust seasonings according to your taste buds. Toss in the chopped scallions. Serve and top with Thai Basil. This can be made with pork or beef. 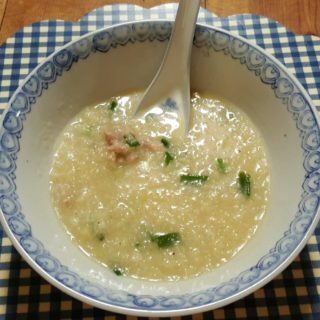 PIN this Pressure Cooker Vietnamese Chicken Congee (Cháo Gà)! OMG! This totally reminds me of my childhood! I make a stove top version using broken rice I get from my local asian mart. I think it’s broken grains of jasmine rice (it’s what my grandma said to use – don’t go against a Thai granny!). Do you think I can use that instead of short grain rice? This is very tasty and comforting to eat. 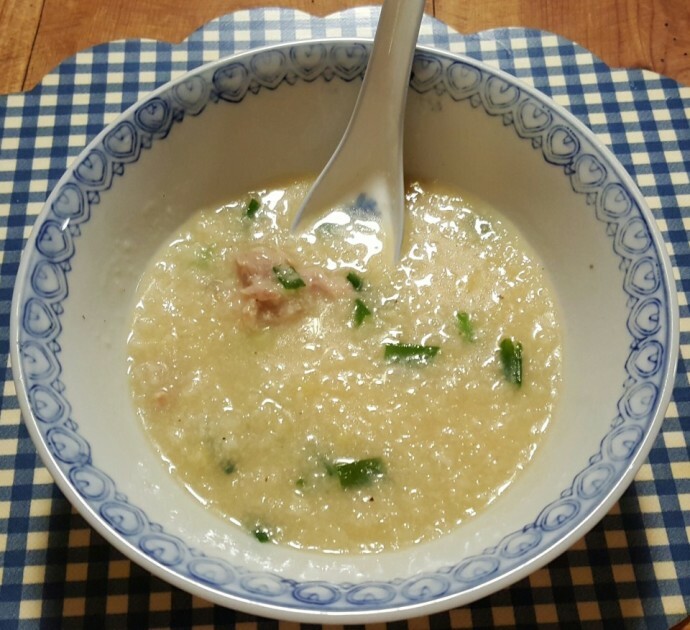 First time having congee and my husband’s delicate stomach was appreciative. He had it for lunch and dinner! I’m sure I will be making this for him again. I made a half recipe as I wasn’t sure the full recipe would fit into the Instant Pot? 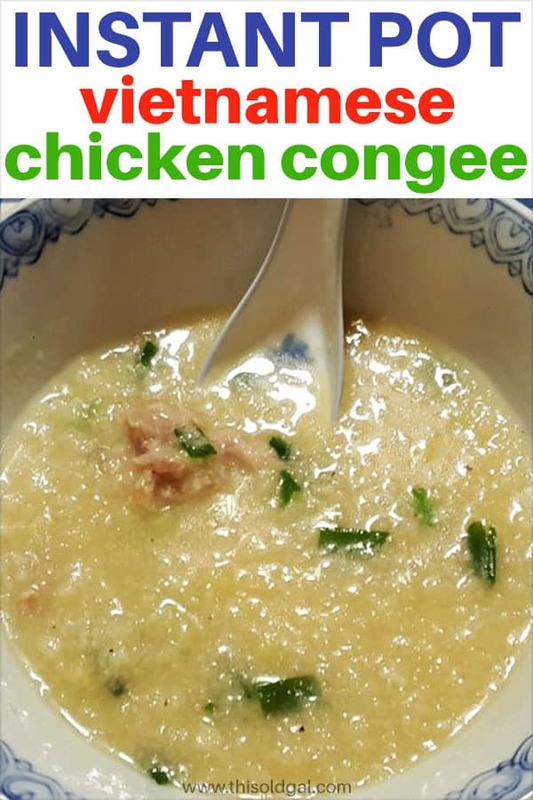 Love congee, fell in love with it while in Vietnam and love the Thai version too. Am defo giving this a go. Have a question, it looks like you are also using the instant pot, so why don’t you use the rice cooker setting for the first part instead of cooking the rice on sauté? I really wish this worked for me! For some reason my IP kept saying “burn” and it was way too full (I have an 8 quart). I ended up finishing this on the stovetop. The flavor was good though!